Warning: This post will make your eyes water. The beauty of Raja Ampat is mind-blowing. How can I best describe a place like this? I will inadvertidely fall back onto clichés… think clear turquoise waters, beautiful people, deserted beaches with soft white sand… A paradise on earth, unspoilt and still largely off the radar, yet so beautiful that you cannot help but add it to your ‘things you need to do before you die‘ list now. Just scroll through the post for some amazing photos that I took on my recent trip there when I was invited by the Indonesian Ministry of Tourism to experience Wonderful Indonesia (and then scroll back up to read on if you want to know how you can do it too). Pianemo is easily one of the most beautiful places on Earth I have ever visited, and the trip out there just to see this stunning scenery made it all worthwhile! I am sure you will think that Raja Ampat is not easy to access. But I think you will be surprised to hear how the local tourism infrastructure is slowly but surely making this place a feasible option for sun seekers, divers, and photographers. We stayed at a fantastic resort on one of the islands, one that has definitely honeymoon potential – Raja Ampat Dive Lodge. To get to Raja Ampat we have to take two flights from Jakarta Airport (Denpasar in Bali is also a possible starting point, so think about adding this short excursion to your existing family holiday to Bali if you like). The first flight brings us to Makassar where we arrive late at night. The next flight takes us to Raja Ampat in the very early morning hours, namely to the city of Sorong. Now, the good thing about Indonesia is that you don’t have to spend the wee hours at the airport when there is a perfectly good airport hotel right in the terminal. Our stopover stay at the Ibis Makassar only cost around $35, and with a shower, air-conditioning and freshly made bed this makes a profound difference to how we experience our flight out to the eastern part of Indonesia. Once in Sorong, and after a hearty breakfast at one of the hotels, we are transported to the port where we board a speed boat to the resort. The transfer from Sorong to the Dive Lodge takes around 2 hrs and the cost is included in the room rate. Now, speaking of room rates, Raja Ampat Dive Lodge is not very cheap to stay at, but given the level of service, the facilities, the quality of food, and the knowledgable dive team these rates are absolutely justified. Here is a link to Booking.com which you can use to book your stay there – note that if you choose to book via this link you will send a small commission my way which in turn supports this blog. I have used Booking.com in the past and am happy to recommend them to you. These are the logistics if you want to travel to this remote region. There may be some bumps along the way and you need to be patient, but when you have a look at the photos of the following four local attractions I am sure you will agree that it’s all worth it. If you are a diver, this place should be even more of interest to you as Raja Ampat offers some of the best diving experiences in the world. In fact, it is said that the coral underwater world is so rich in nutrients and teeming with life that it is considered a nursery for other coral reefs that sometimes need migration of new fish to sustain themselves. Ok, so this is really ridiculous. How can a place like Pianemo be so damn attractive it almost hurts your eyes? 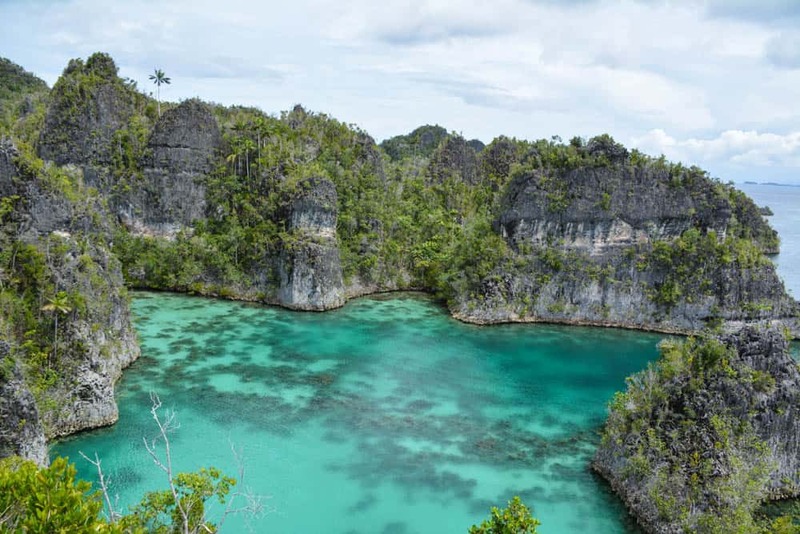 Pianemo is truely the gem in Raja Ampat’s crown, the place that is synonymous with the whole region and that has put it on travellers’ maps in the first place. The coral islands have risen from obscurity to stardom within years, and not without reason. When you land in Pianemo by boat there are several ways how you can experience the place. You goal is it to see the islands from above, to have the sun infiltrate the water to reflect back in the most amazing shades of blue, green and everything between. This will involve some climbing, and it will not always be easy, but the views are simply astonishing and very rewarding. Our boat offloads a handful of people right at one of the first steep coral islands – no more than maybe five or six to avoid overcrowding on the tiny island. No jetty to speak of (did I mention that it won’t be easy? ), so our daring fellow passengers have to jump from the board right onto the island. Just some patches of concrete, loosely dropped onto the razor-sharp coral make the ascent more accessible, so this is the place where you would want to put sneakers before flip-flops. Our second stop seemed easier, so I join this group of travellers for the ascend. A jetty helps with the initial orientation and then we are all heaving our equipment up the steep rock, slowly and carefully navigating from one concrete patch to the next. One false step and you will cut your bare legs on the sharp coral, or even worse you can see yourself tumble and fall down several metres. This is not a way of seeing Pianemo when you have children in tow. But boy, do these views reward you for your courage! From up here you can clearly see the star shaped bay, one of the wonders of Pianemo. The water so clear, you can see the corals on the ocean floor. The colours are just amazing. The forest around us is pristine and untouched, just beautiful. A couple of minutes is enough to take in the beauty of the scenery and to take some photos. We return to the jetty for pickup just in time before the heavens open and soak us in a drenching tropical rain shower. Another lesson learned: if you take technical equipment like cameras with you, make sure you pack a rain cover of some sort as well. From our exclusive vantage point we are also taken to the general lookout stop that most visitors will see. The jetty here is broad and loaded with locals who are selling fresh fruit, soft drinks and live crabs. From the jetty it’s just a flight of wooden steps to the two viewing platforms, with cabanas along the way so that you can catch your breath. This viewpoint is much more accessible and can be conquered even by little children. The views from here are no less enchanting and will give you the familiar picture as you would know it from a Google Image search. It needs to be low tide in Raja Ampal in order to see this place so you need to time your visit well. Pasir Timbal is no more than a sand bank in the middle of the ocean (not quite correct, it is next to a tiny island), that will work like a painter’s palette in front of your eyes. The soft white sand, risen to just half a meter under the surface, lets the clear water of the ocean glow in the most vibrant colours. A feast for the eyes, an irresistible temptation to just hop off the boat and wade to the beach, clothes and all. Perfect for amazing photos, of course, or to just simply enjoy your very private moment in paradise. Just treat yourself to a couple of minutes of doing nothing at all before returning back to your boat. Oh, but do make sure you have plenty of sunscreen with you as the strong sun is reflected back onto your skin from all sides. No photos, no videos when the kids are dancing. These are our orders as we approach Arborek Village in the heart of Raja Ampat. When we get off the boat we are greeted by a group of children, two boys, four girls ready to dance, two older kids providing the music. The kids are painted with white colour, their hair is curly and brown, they look more like the people I know from Vanuatu than the people from Jakarta. Indeed, these children are Ambonese, i.e. they belong loosely to the Melanesian race, placing them closer to the people of the Pacific than to the people in Indonesia. Their dances are not unlike what I have witnessed in these other islands, several hundred if not thousand kilometres to the east. These children are professional dancers. Their dances tell stories of animals and people, of hunting and fishing, or life on the island. Their performance on the jetty for us is just wonderful. After the dance we are escorted off the jetty and into the village. Adults start beating the drums, there is a lot of noise and cheer as the children take our hands and lead us to the nearest beach. There, under the shades of massive fig trees we enjoy the unspoilt views of the bay while we sip on freshly opened coconuts. The children keep us company while we relax or cool our feet in the shallow water, the atmosphere is cheerful and happy. Arborek village is real village in Raja Ampat. Nothing pretends to be something it is not. But the villagers are also quite business-savvy. You can stay on the island for several days if you like. There are a number of homesteads you can choose from, not expensive at all, but very basic. You will have to live without hot showers, sleep on a mattress on the floor, endure the heat without air-conditioning. Power cuts do happen, and the shops carry only the most basic supplies. However, there is also a dive centre in Arborek, and given the rich biodiversity in Raja Ampat this is a good enough reason for many people to go back to basics for a couple of days. Even snorkelling is great here, with giant clams living right off the jetty, not hard to locate at all. Not just the people but also the village reminds me a lot of Vanuatu. I take a stroll around the island. It only takes me 15 minutes, mind you, it is such a small place. No cars, not even motorbikes – the smallness of the island doesn’t justify motorised traffic. The roads are hardened sand, the house painted in bright blue colours. The people here take pride in their village, the gardens are packed with blooming flowers and shrubs, the yards are neat and tidy. It is a peaceful place, so removed from our hectic 9-5 life. It would be easy to just throw your worries overboard and just relax here for a couple of days. After a delicious meal of grilled fish, chilli and cooked vegetables we move on to our last stop, but not without a quiet regret to leave this paradise. Our last stop in Raja Ampat is at Kabui Bay. In a landscape that we can now identify as typical for the region we see tall sea-stacks rising from the water. This time though we are not climbing on top of any of these structures. Along some of the stacks there are wooden jetties which allow us to easily get off the boat and have a closer look at the karst stone. It is an amazing scenery, with the islands of soft limestone slowly dissolving and eroding in the sea water. Each of them unique in appearance, you can spend a whole afternoon finding familiar shapes and forms in the playful rock formations. Like hair they are topped with dense tropical forest, with trees proving once again that nothing can stop life from procreating, not even barren limestone cliffs in the middle of the water. The area is known to be an excellent dive spot but we are not visiting for this today, rather we just enjoy the beautiful scenery before heading back to our resort. I have also been told there is an underwater sea cave which you can explore if you dare. There is the option to visit a site with ancient handprints on the rock surface, not unlike what you would see in certain spots in Australia, but they are high up and not very visible. You will need to ask a local to take you there. By comparison, but also because the sun was hidden behind a cloudy haze by the time we arrived in Kabui Bay, Pianemo seemed the better option, in particular because of the bird’s eye views, but if you get the chance to visit both sites, do not let the latter slip through your fingers. Love Indonesia as much as me? Have a look at my other Indonesia travel blog posts!